Mid-day coffee and light snacks will be served on the exhibit floor Wednesday, Thursday, and Friday from 11:00 am to noon followed by an evening bar service and hors d'oeuvres from 4:00 to 6:00 pm on Wednesday & Thursday only. 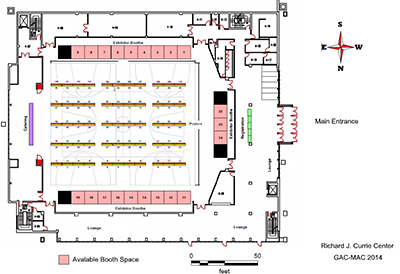 The central hall at the Currie Center will host the trade show along with the poster sessions which are focal points of the conference (see attached floor plan). The registration, lounge areas and coffee stations will be set up in the foyer to the main hall with a spectacular view of the St. John River valley and the historic city of Fredericton. The Icebreaker Reception will also be held in the Trade Show area. Click here for a detailed floor plan showing exhibitor booth locations (271kb .pdf). All cancellation requests must be made to the Exhibits Coordinator in writing, no later than April 1, 2014. A $100 administration fee will apply to all cancellations made before April 1, 2014. No cancellations will be accepted after this date and the Exhibitor shall forfeit the Booth Rental Fee should the Exhibitor cancel after the April 1, 2014 or fail to attend the Conference. The date that a specific exhibitor’s cancellation request is received will be the official cancellation date for the exhibitor. The conference and trade show on site service provider is Global Convention Services Ltd. (web site: http://www.globalconvention.ca ; Tel: 506-648-0506; Fax: 506-658-0509; attention Greg Condon. Exhibitor Booths are 10 x 10 feet in size. Each exhibitor booth is supplied with: Pipe and drape booths consisting of an 8ft high back wall, and 2 - 3ft high side walls. Each booth shall contain 1 - 6ft dressed table, 2- chairs and 1 - 15 amp electrical duplex. Carpet and under pad is available at an extra cost of $169.50 (HST included). Additional presentation services/equipment (digital services, computer equipment, projector rentals, etc.) can be arranged two weeks in advance by contacting Exhibits Coordinator: Robin Adair (robin.adair@bellaliant.net ; Phone 506-259-4310) or any other audio visual provider you choose. Wi Fi Internet connections are complimentary and provided by the University of New Brunswick. Any notice or enquiries should be addressed to the Exhibits Coordinator: Robin Adair, E-Mail: robin.adair@bellaliant.net ; Phone 506-259-4310. A parking permit will be provided to Exhibitors as part of their package. Additional permits can be purchased at the registration desk.